Pull rod-hung curtains out to a full 90" from wall, push back to an out-of-the-way 39" or flat against wall. 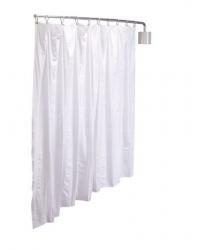 Flame-retardant, white vinyl curtain is 72" high. Kit includes wall bracket, telescoping rod, curtain and hooks. Vinyl screening meets minimum requirements of flame resistance of CA fire marshall for products identified in section 13115, CA health and safety code, and NFPA# 701.